Toronto: Natural Heritage Books, 2010. When the Lincoln Alexander Parkway was named, it was a triumph not only for this distinguished Canadian but for all African Canadians. 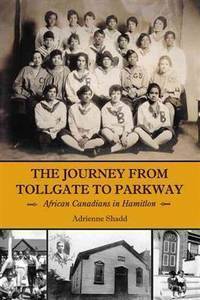 This book looks at the history of blacks in the Ancaster-Burlington-Hamilton area, their long struggle for justice and equality in education and opportunity, and their achievements, presented in a fascinating and meticulously researched historical narrative. Although popular wisdom suggests that blacks first came via the Underground Railroad, the possibility that slaves owned by early settlers were part of the initial community, then known as the 'Head of the Lake', is explored. Adrienne Shadd's original research offers new insights into urban black history, filling in gaps on the background of families and individuals who are very much part of the history of this region, while also exploding stereotypes, such as that of the uneducated, low-income early black Hamiltonian. 374pp.. Paperback. Like New/No d/j as Published. 8vo - over 7¾" - 9¾" tall.